V and I were browsing Ebay for weird stuff today, and came across this potato that looks like a fetus, which they call the "Right to Life Sweet Potato". 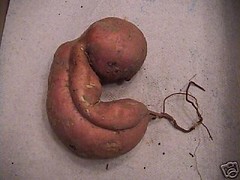 Strangely, this disgusting veggie doesn't exactly inspire me to rally against abortion. If anything, there should be less creepy fetus things in the world. Still, I like creepy things, and having a little tuber tot on display would certainly make for interesting conversation. Unfortunately, it's a little bit out of my price range: over 23 000 dollars. Some of you loyal readers may be rich though, so feel free to buy this incredible edible fetus for me for Christmas. I have a great recipe for potato pancakes that I've been dying to try out.